3D modeling now involved in different spheres of our life. Sport is huge part of our life and of course you can create 3D models of sports inventory, arenas and more. Today we will go through the soccer/football ball creation process, it would be related to the recent World Cup finals. 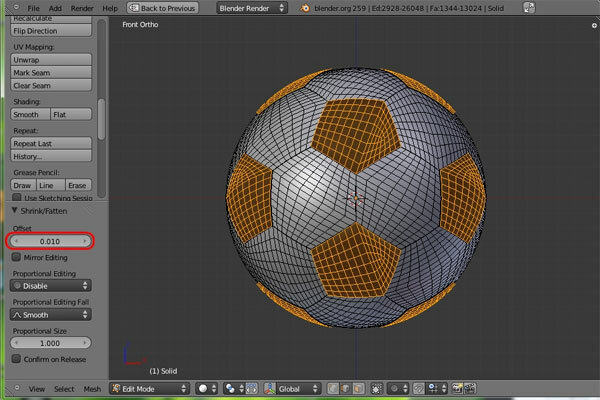 if you want to make a soccer ball, but do not know how to do it better, check this fast method that practically nullifies the process of difficulty in modeling and the built-in addon will help us. So, let’s begin! Open the Blender. Go to the File menu, open User Preferences. 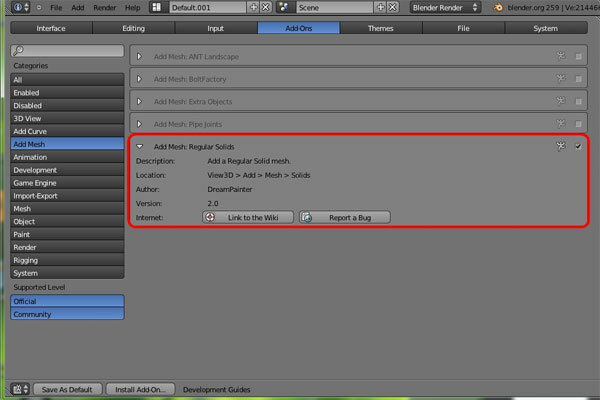 In the Add-Ons submenu, click the Add Mesh tab and activate the Regular Solids add-on and close the User Preferences. In the 3D window, press Shift + A to add an object and in the Mesh tab select Solids -> Solid. 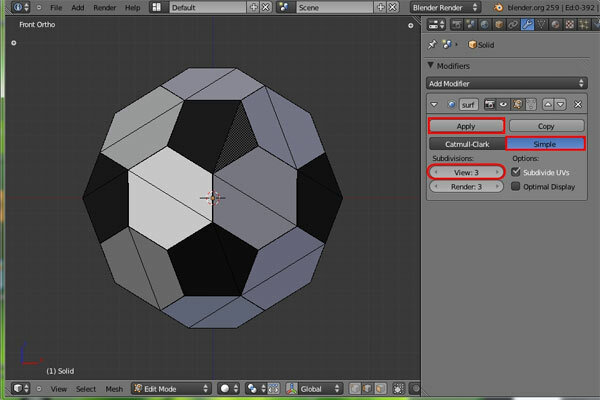 Press F6 and change the settings: Source – Dodecahedron, Vertex Truncation – 1.3. After that, your mesh should look like this. Next, in the Properties window, on the Modifiers tab. 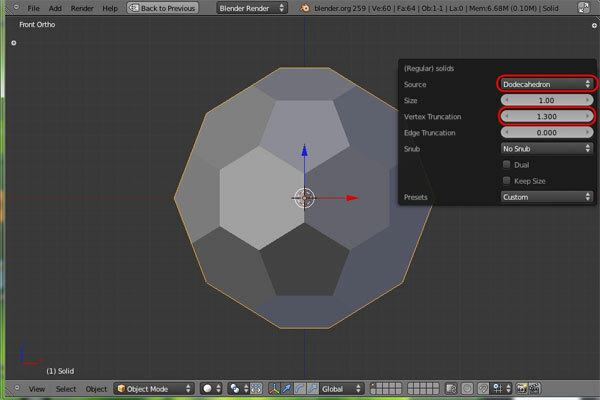 Add the Bevel modifier and the name of the setting: Width – 0.0015, Limit Method – Angle, Angle – 30 degrees. Apply the modifier. Now let’s add the materials to our ball. Create 2 slots for materials using the “+” button in the Materials tab. Then click the New button. Name one material, for example, White and the other Black. Change the material of Black diffuse color to a dark gray (Do not make the color absolutely black: it will be inconvenient to work and in nature it is not possible to meet an absolutely black color). Now we need to properly assign materials. Go to edit mode and select 2 polygons that form one pentagon (to change the selection type press Ctrl + Tab and select the desired type, in this case Face). Press Shift + G or select Similar from the Select menu and select the type of the Selection Area. After that, all the pentagons should be selected. 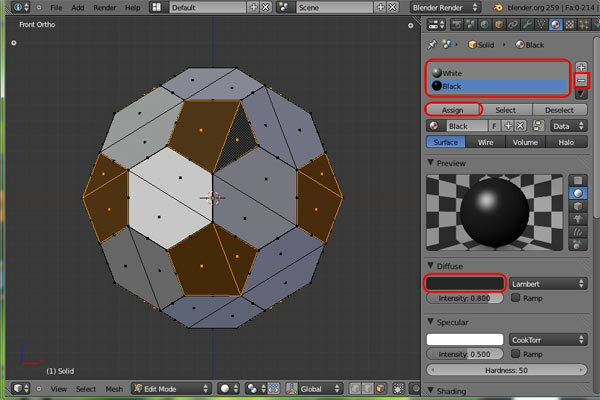 Select the Black material slot and press the Assign button with the selected pentagons. Hooray! pentagons have become black, already something like a ball. Now let’s make our ball round. 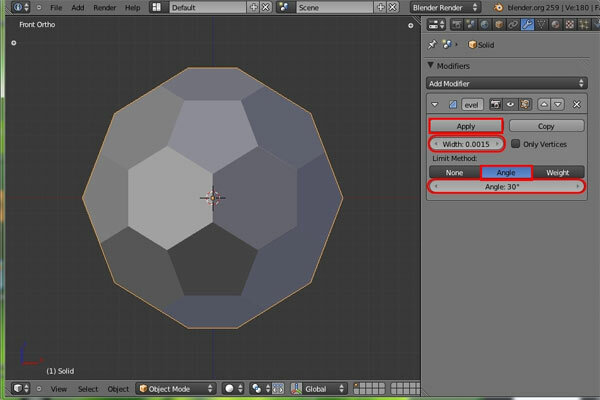 Add the Subdivision Surface modifier, select the Simple type and raise the number of units to 3; apply the modifier. 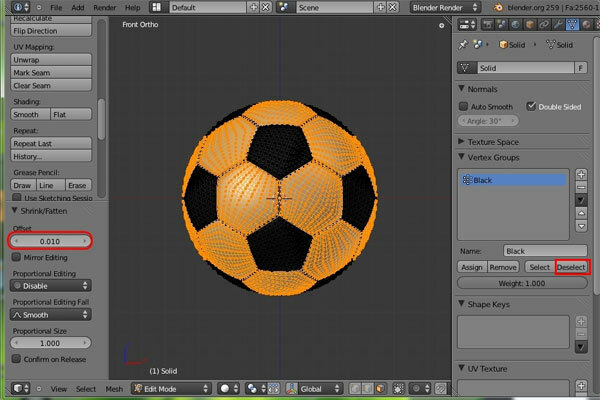 Switch to edit mode and select the entire ball using the hotkey “A“. Then press Shift + Alt + S or select the To Sphere option in the Transform fold of the Mesh menu and make the To Sphere 1 indicator (you can press “1” on the keyboard, bring the value with the mouse or change the applied result in the T-menu). To avoid seeing the edge, press the Smooth button under the Shading tab in the T-menu. Well, it looks like a ball. Now we need to add a little bit of volume to the black and white segments. In the editing menu, deselect all vertices (hotkey “A”). 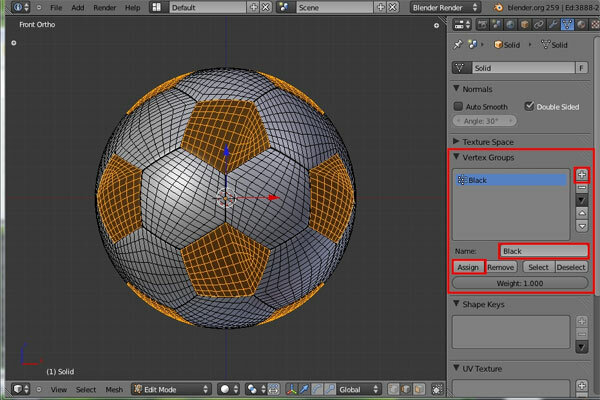 In the Properties menu, go to the Materials tab, select a slot with black material, and click the Select button; after that the black parts of the ball should stand out. For convenience, create a vertex group in the Object Data tab. Click the “+” button in the Vertex Groups window and click the Assign button, name the group of vertices Black. Now extrude the selected vertices and press Esc to cancel any transformation. Now we need to extrude the vertices along the normals. To do this, press Alt + S and squeeze polygons to -0.01. It is most convenient to enter a value using the keyboard or change the applied result in the T-menu (if you chose the last method, then the value must be entered without a minus). Now let’s squeeze out the white hexagons. To do this, select one hexagon (just do not select the chamfer!). Next, press the already familiar combination Shift + G and select the type of selection Area. Not exactly what we wanted to stand out, the black parts of the ball hit the selection, but now we will fix it. In the Properties window on the Object Data tab (for sure, you are still there) in the Vertex Groups window with the selected Black group and click Deselect. Allocation was removed from all black pentagons, this is what we need. Now repeat the procedure of “extrusion”. Extrude polygons, press Esc, then Alt + S, -0.01. Almost everything is ready! 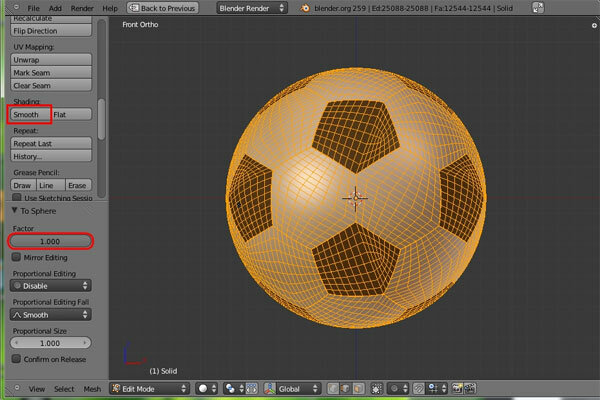 It remains to add the modifier Subdivision Surface and our ball is ready! There are plenty of other sports activities and many other sports inventory 3D models on https://www.flatpyramid.com/sports-3d-models/, you can buy them for your projects or, if you have already cool sports related 3D models you can sell them too!